I admit, I was hesitant to start this book. The whole “magical powers enacted by touching people” idea has been done before many times in YA lit. I can think of at least two stories I’ve read already with similar concepts and another one that I know about just off the top of my head. But Jackson manages to tell such a unique intriguing story with one of the strongest heroines I’ve come across in a while. I can’t say I loved this one, but I greatly enjoyed it. To begin, this book is not for everyone. There are many sequences of physical abuse that are pretty detailed. If violence makes you uncomfortable, this certainly isn’t the book for you. Remy’s stepfather, Dean, is an alcoholic. He feeds off of not only Remy’s pain, but her mother’s as well. And instead of allowing him to ruin her life, she allowed him to make her stronger. She wouldn’t break under him, despite the fact that he would break her bones because he was so maniacal. She became emotionally fortified and determined to survive--easily one of the toughest characters (both physically and emotionally) that I have found in a long time. I really enjoyed this aspect of Remy’s characterization because she wasn’t looking for sympathy and pity the way many abused characters do. While the abuse was a huge part of her life that caused her to create a huge shell around herself, when forced to face new situations she slowly opened herself to the possibility of a normal life with friends, family, and most of all, love. It’s safe to say I really, really like her. But I have to say that the most interesting concept of this novel was her “super-power” and the lore that came hand-in-hand with her enemy. Remy has the ability to heal others by touching them. She simply has to picture their wound and the energy from her body will enter theirs to end their pain, but by doing so she will make their maladies her own. If she goes too far she can experience severe hypothermia and extreme pain that makes it seem as if she herself will die. I really loved the selflessness she exhibited at all times when helping others. And what I found even more interested was the concept of Protectors. They’re pretty much like superhuman ninjas because they’re fast, they’re immortal, they’re drop-dead gorgeous--but they can’t feel anything. The price of immortality? The loss of your senses. Whereas Healers like Remy feel too much, Protectors like Asher and his family feel too little. While I must admit that Asher was a very great love interest because of his genuine concern, love, and care for Remy, I think that their story was very cliche in the beginning. It’s very new girl moves to town and is immediately fascinated by the town bad boy that is known for using girls so everyone she quickly befriends warns her off him immensely and she ignores everything they say. While I really liked the two of them, I was hoping such a unique story could avoid the cliche aspects of the plot line. Full of one of the best cast of characters I’ve come across in a while, Jackson tells a story of selflessness and self-discovery with a really great and unique paranormal twist. 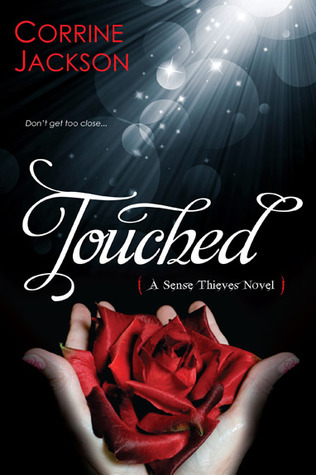 If you’re looking for a unique romance with a perfect dash of paranormal abilities, this is a book that you will enjoy. I don't think I've heard of this one before. I like the concept of healing people with your touch, and Remy sounds like such an amazing character. I love the sound of her strength and being able to deal with the things she does. Great review! I loved this book a who lot. Your review is spot on and I was super hesitant about starting this book. I thought the whole thing was going to be really over done but it turned out to be a great surprise.